Do you dread1 your long commute to work each day? Do you hate spending hours sitting in traffic in your city? Unfortunately, the daily commute2 has become a dull3 routine that we go through each day as populations increase across the world, especially in big cities and metropolitan areas. Unless you work from home, it is likely that you spend a large portion of your day going to and from work. Research shows that on average we spend around 70 minutes each day commuting. Fortunately, after starting your day off strong4 by igniting your mind in English and having a breakfast of champions, there are a few simple ways to ride the positive momentum5 that you created in the morning into your daily commute. Instead of setting off6 for an ordinary day at work, transform your commute into an EPIC journey! Your commute to and from work doesn’t have to be boring. Liven up your day by playing your favorite English songs. If you drive alone to work, here is your time to shine. 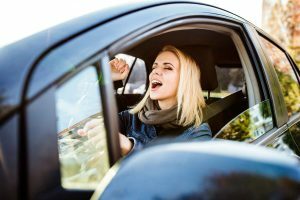 Turn up the music in your car, and sing along. Don’t be afraid to make mistakes. Let go and become the superstar that you always dreamed about. Are you a fan of one-hit wonders8 from the past? Why not sing along to classic songs such as Don’t Stop Believing by Journey or Ain’t No Mountain High Enough by Marvin Gaye? Have fun with it. It’s your personal concert. You are the star. Choose your favorite jams9 to sing. If you take public transportation or ride with other people to and from work, you can still enjoy listening to music without singing out loud. Before you leave for work, create a playlist of songs that you want to learn the lyrics to, and download the app Musixmatch. When you turn the app on while listening to music on your phone, YouTube, or Spotify, it automatically generates the lyrics to your current song. While you listen to your favorite songs, you can write down words and phrases that you don’t completely understand, and review the parts you don’t understand later. Podcasts are an excellent resource for practicing English during your daily commute. They can help you refine10 your listening skills and learn new vocabulary in English. They are also a great opportunity to dive deeper11 into questions you are curious about exploring. You can use them as a resource for learning more about subjects that you are interested in. There are many practical podcasts available online for English learners such as the RealLife English Podcast. More adventurous learners can even explore podcasts on business, personal growth, health, relationships, politics, sports, or news. There is a limitless number of podcasts to choose from. It is really easy to start using podcasts to improve your English during your daily commute, especially if you take public transportation. First, choose a podcast episode that you find interesting that you want to use to practice for the week. Once you choose a podcast episode, try to listen to it once at normal speed without taking notes. Afterwards go back and listen to it again. If it was too fast the first time, trying slowing down the audio speed and take notes. After the second time you listen to the podcast, try to write a summary about what you listened to. Finally, listen to the podcast at normal speed again and check to see if your summary makes sense. If you are feeling brave, feel free to share the summary with a supportive community of friends that are also learning English, or with your English coach. You can use the podcast episode that you listened to in order to spark12 a new conversation. If you would like to listen to these podcasts on your way to work, you can download them on iTunes (iPhone) or Stitcher (Droid). Audiobooks are also good resources to listen to during your commute. If you listen to audiobooks everyday, you will constantly be learning new things and expanding your imagination. Unlike podcasts, one advantage of audiobooks is that you can follow along with the text if you own a copy of the book. Though the vocabulary used in audiobooks is more formal, you can use the opportunity to learn less commonly used words. It can also be really entertaining to follow a story from start to finish. Turn your commute to work into an adventure by listening to classic fantasy novels such as Harry Potter, the Hobbit, or the Chronicles of Narnia. If fantasy novels aren’t your favorite, pick audiobooks in English that you would be interested in reading in your native language. You could even listen to your favorite books from your childhood. Have fun with the process of listening to audiobooks. Why not create an English book club? Every month choose an audiobook to listen to and read with your friends that are also learning English. Decide on a day each week to get together and meet to discuss the book in English. It is a great way to practice English with your friends. Now that you are armed13 with three easy strategies to practice English on the way to work, it’s time to put them into action. Today when you embark on your journey to the office, download some music, a podcast, or audiobook to listen to and make your commute to work EPIC! If you enjoyed this article, and are looking for more ways to make your English a life-changing global adventure, download a free copy of the RealLife English Manifesto: A Master Guide to RealLife Fluency and start living your English today! This is very helpful I love it..
Keep it up seeking forward to learn more from you. Thanks Cindy! I appreciate you for reading. Keep following along and you will definitely get a lot of tips for your journey!